Okay, we all know that model railroading is supposed to be a "guy thing." But there are many opportunities to make it into a family hobby. Garden railroading has even more potential - many existing garden railroads show a woman's touch, in the choice and placement of plants and accessories, and even sometimes in the "traditional male roles" of kitbashing and coupler changeovers. Getting and keeping the kids involved can be a little harder, with children having such crowded schedules and so many entertainment options these days. Still, this article, based on trial and error (mostly error) lists a few things we can do to help our children get and stay enthusiastic about trains. Update for 2013: When I first wrote this article, I was thinking mostly about Large Scale trains, the kind meant to be used in the garden. Many of my examples are still Large Scale. But in retrospect, I don't think that Large Scale trains are a bad choice for transitioning youngsters from "playing with toy trains" to "enjoying model railroading." (If you already have some Lionel O27 trains onhand, that can work too, as long as you have time to help the kids set them up the first few times.) For one thing, it's easier to teach kids about railroads, operations, and the like if they're not spending all their time trying to get and keep smaller trains on the track. That said, several of my favority kid-friendly Large Scale trains are no longer available. So in our related "buyer's guide," Garden Trains for Kids, we list the best current choices. But we also have a section for some great discontinued trains, in case you come across one on eBay or whatever and wonder if it would be a good investment. We have also expanded the section on teaching through play - today's adults can no longer assume that kids know what trains actually do - even if they watch Thomas (very little actual railroading happens on most episodes). I hope you are reading this while your kids are still small. If your kids are grown, but your grandchildren are small, feel free to read the word "grand" into sentences with the words "kids" or "children." Today's 4+ - year old kids have hundreds of Brio and Thomas train products to play with. Some are even powered. And spending time playing imaginatively with the kids and their trains will get them off to a good start. But there comes a time when they're too old for Brio and not old enough for real model trains. Sometimes it's hard to find trains that fill that gap. At the moment, the best "transition train" for a lot of families is probably the Bachmann Li'l Big Hauler set. Before that it was probably Lehman's Toy Train line (now discontinued), and before that it was probably the more kid-oriented Playskool Express (long discontinued). The point is, if you have been in the habit of constructive, instructional play with the kids and their trains since they were little, a time WILL come when they can still enjoy constructive, instructional play, but the Brio or Thomas trains no longer appeal to them. 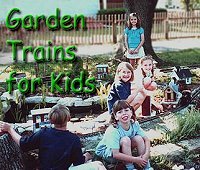 We have reviewed several current and discontinued sets you might find helpful in a buyer's guide called Garden Trains for Kids. Some of the product names are linked to those reviews. If you click on the link, it should open a new window that you can close when you're ready. If a new window doesn't open, just use your browser's back button to get back here. Trains for Babies? - Obviously, infants will chew on anything, and toddlers will attempt to put anything in their mouths that's not bigger than their heads. Frankly, I'm not certain train-related toys for very young children are going to stir much interest in the hobby, anyway. If you adhere to the Suzuki method, I don't know that a stuffed Thomas will do any harm, but I can't promise it will do any good either. So I'll move on to the next age group. Trains for Pre-Schoolers - Since Brio introduced its line of push-trains for small children, several similar brands, some compatible and some not, have come on the scene. Some even have battery-powered locomotives, so your little ones can "run trains." Some of the smaller pieces are still dangerous for toddlers and if the batteries come out easily, those are very dangerous. It's possible to spend a lot of money on a system that your kids will outgrow. Before you invest in a couple hundred dollars worth of trains and train tables, check your local Craig's list or other classifieds for used sets in good condition that you can use to "jump-start" your childrens' railroad. Just be sure to disinfect everything thoroughly before it goes into the playroom. Transitional Train Sets Your kids may want something less "babyish" well before they're ready for real "train sets." Sadly, there aren't many products that bridge the gap between kids' toys and model trains. Except for a PlaySkool set that was made in the 1980s and briefly in the 1990s, most battery-powered train sets are made to last one Christmas season period. One line we've used with "four-year-olds and up" under supervision is Lionel's "G Gauge" battery powered trains - though they still won't survive unsupervised abuse like throwing and stomping. My favorite is their Polar Express set, but the freight sets are pretty solid, too. Little kids can't put them on the track. But they can push the buttons on the remote control. We've set these up for kids to run at our outdoor open railroads three times, and delighted many children. Our Lionel's Toy "G" Trains article takes a closer look at these and explains why they are better than the department-store brands. The "Battery Powered Alternatives" section of our Garden Trains For Kids buyer's guide lists a few that were available as of August, 2013. Also deserving of honorable mention - Scientific Toys' EZ-Tec trains, which are usually hard to find, but occasionally show up at Christmas. They also tend to be more sturdy than the average department-store battery-powered plastic train. Over the years, several model train companies have introduced Large Scale electric trains that (except for putting the track together) were suitable for 6-10-year olds. Bachmann's Thomas and Friends Trains - These sets don't quite belong in this list - they're toy-like trains that need parental supervision, at least while the track is being set up. Frankly, by the time kids are big enough to set these up on their own, they may want more realistic trains. Nevertheless, they're well-made, sturdy family-oriented toys with lots of play value. By the way, Lionel has made similar trains in the past. We've compared the two lines in this article. Bachmann's Li'l Big Haulers - Bachmann, who has been making Large Scale (garden) trains since the mid 1980s, recently introduced a Large Scale-ish series specifically for children. They operate much like Bachmann's "big people" trains, but they are sturdy enough for youngsters to use (under supervision). They are also compatible with Bachmann's Thomas and Friends trains. Lehmann (makers of LGB) made a series of "Lehmann Toy Train" starter sets. They're not being made now. In fact, LGB has gone bankrupt and been bought out twice in the last several years, but the new owners promise reintroduce the Toy Train line eventually. In the meantime, if you can find a set in good condition you won't be sorry (unless you make the mistake of playing an inflated "collectors' price" for it). Not only do the trains above run on 45mm track, but they're compatible with most Large Scale train equipment. Cost-wise, they are also pretty good values, by Large Scale standards. Many ordinary "starter sets" can also be used by ordinary elementary school children, with some supervision. The Bachmann starter sets that occasionally hit the warehouse clubs in the months before Christmas are a good value and sturdy enough for kids to use and enjoy. If you see the 1980's-era Lionel "Thunder Mountain" train for a good price, that train is one of their sturdiest Large Scale trains (although big people need to put the track together). You ge the idea. Note that we're talking about "Age-Appropriate Trains," not "Cheap Trains." Every Christmas, toy store shelves include battery-powered, plastic-tracked trains. These trains are typically poor models, which won't do much to hone a child's taste for trains. But, worse yet, they're prone to breakage, and they don't run very well. Giving a child a plastic toy that looks like a train set but doesn't work for long won't necessarily do much to encourage the child in the hobby. In fact it could do more harm than good. When a parent tells me "We tried trains once and they didn't work out," they're usually talking about a $50 seasonal set. Consider having a railroad somewhere that's just for the kids. If you have a test track (inside or outside), let the kids "own" it. During open houses and other visits, let the kids demonstrate it and supervise the visitors who use it. This is a good place for them to develop scenery and construction skills as well. I've discovered through my family's experiences that you can't build a lifelong enjoyment of railroading with a hobby that only lasts four months a year and a couple weeks in December. When my children were little they didn't have a place they could leave their trains out and run them indoors. This may or may not be the same as the "children's layout" in the previous section. But it should be a place they can go to, year round, and run their trains. Otherwise, trying to get the kids "back on board," say, every May and December, eventually leads to an attitude like, "What's the point?" Even if it's only a 48" loop somewhere, it will mean something to them. If you have room outside to set up a circle or oval of track somewhere for the kids to use in nice weather, that's great, too. When we have visitors coming over we often set up plastic track and Lionel "G" battery trains on flat surfaces like the well cover or the old swimming pool deck. If you'd like to try your skills on a "test railroad," consider building a Temporary Outdoor Railroad. Many a future master modeler got his or her start assembling Plasticville structures or blowing up "dynamite cars." In my own experience, I've seen many children who weren't particularly interested in the train itself, become very interested when I get out the little people, animals, and other accessories for them to "set up" for me. On visits to garden railroad "open houses," I've seen that my own children and others most enjoy the railroads where the owners have included a lot of human detail and similar objects. On a stranger note, my children still talk about a tinplate layout we visited about twenty years ago. A Lionel mail car was supposed to snag or deposit a mail bag when it passed the station, but, as often as not, the mechanism hurled it across the room. The kids got a bigger charge out of that than they would have if it had worked properly every time. To a certain extent, the "train set" can really be an excuse to play with toy people and funky action accessories that the kids don't come across in any other situation. Take advantage of this; let them have their "own" people and accessories, and be certain to take time to "play" with them. In times past, several model train manufacturers that made kids trains made toy accessories to go with them. At the moment, not many are available, but European toy manufacturer Playmobil often has pieces that make good accessories. 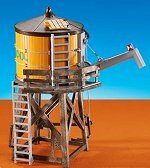 Playmobil is not for small children, but their water tower, and several other sets work great with the trains on this page. Kids enjoy setting up the trains. A week from now, they'll have just as much fun taking the railroad apart and setting it up differently. Take advantage of the "fun setting up" dynamic by buying extra curves and straights (and, eventually switches, crossovers, etc.) so they can experiment with different track plans. In the world of battery-powered G gauge trains, I have to warn you to try to stick with one brand of track. All the battery-powered G gauge trains will run on each others' track, but the track from the different brands doesn't fasten together. (I have a bunch of the original Bachmann Big Hauler plastic track that all of my battery-powered "kids trains" run on just fine.) Try not to spend a fortune on plastic track, though - I've seen hobby shops charge as much for a foot of plastic track as they charge for a foot of top-quality brass track. Kids like making and painting things. Let them build kits, paint "little people," or otherwise contribute to the creative effort. Even if the end result isn't up to your modeling standards, it will mean a lot more to the kids than something that you put together by yourself while they were on the Playstation. Because I believe in putting a great paint job on models, much of my "modeling" is really done with a spray can. You would not believe how hard it is to get a child (or many adults) to use a spray can effectively. But once they learn to do that, or to mask off areas, or to perform a thousand other skills that go into building a railroad, they'll have pride of ownership, and a range of skills that they can apply to other hobbies, interests, and even home repairs as they get older. Of course, it helps if you also have a "children's railroad" on which some of their more, unprototypical results can be displayed. A couple generations ago, everybody knew what trains did. Some of the Thomas stories show the trains doing something functional, but there's not always a clear explanation as to why, say, Thomas has to drag the Troublesome Trucks to Ffarquhar station. For Thomas fans, the "why" may never register. Kids who haven't had a lot of exposure to trains - even fictional ones - may have no idea what trains do besides going in circles. So, as you play with the kids, take advantage of opportunities to help them understand the "why" as well as the "how" of train operations. Setting up multiple stations or waiting platforms so plastic or imaginary passengers can travel from one station to the next, then back later. Simply having the kids stop the train at each station so passengers can get on or off is a basic operation that reflects real railroad practice. Explain what the different kids of freight cars are for. If possible set up, say, a coal mine and a power plant, or a "forest" and a lumber mill or similar combinations of industries to give a reason for hauling freight. For the purposes of this kind of "play," the stations and industries could be cardboard boxes with windows drawn on them, or the like. Frankly the "why" is more important than the "what" - you can always assemble a station kit later, but if you miss the "window" for explaining what freight stations are for, you won't get that back. Along with this, explain what the various kinds of freight cars are for. Flat car, staked flat car, gondola, tank car, hopper, ore car, covered hopper, box car, container car, refrigerator car, caboose, baggage car, dining car, observation car, sleeper, coach, etc. You can do this with toy trains as well as with model trains, and the kids will easily absorb knowledge that they'll retain for the rest of their lives. And that they'll apply every time they play with, model, or even see a train. If you have a steam engine, set up models or cardboard mockups to represent a water tower, sand house, and coal tower to service the locomotives, and explain why the locomotive needs all three before it takes off. Else if you have diesels, have them stop for fuel. Train-related games on the computer, "Rail Tycoon," etc. Simple gardening tasks, like poking sedum starts between the rocks on the "mountain." No matter how much your kids love trains when they're small, they will accumulate other interests as they get older. Some of those interests, like sports and marching band, will eventually take so much time that the children couldn't stay active in railroading even if they wanted to. In fact, no matter how wonderful a parent you are, one or more of your children may even come to think (for a time, at least) that you and everything you do (including your hobbies) are stupid. But more often than not, when your children settle down somewhere and have children of their own, their links to the past, and even to you, will become more important again. As I update this article, I have three grown daughters who still like setting up their trains at Christmas and, when possible, helping me in the yard with our garden railway. Time will tell how much love for trains they pass on to the next generation. But one thing's for certain: I will have spent many creative hours with my children, and that will count for something.